Bangabasi Morning College owes its conception to the rich and cultural heritage of the hallowed institution of Bangabasi College; founded by Acharya Girish Chandra Bose, a great patriot and follower of Pundit Iswar Chandra Vidyasagar, has completed its hundred years of glorious existence about two decades ago. Historically speaking, Bangabasi Morning College started its career as a unit of Bangabasi College as far back in 1947. It was at this time when the country own its long cherished freedom the college experienced an unprecedented pressure of over numbering students. The partition that followed after independence was the immediate reason for such. The roll strength of the college began to swell heavily with the influx of young students from the East Bengal and the college has to open shifts in the Morning and Evening Hours. The Story of the BANGABASI MORNING COLLEGE may be said to begin from this crucial juncture of national life. Thus, in its initial stage, BANGABASI MORNING COLLEGE continued its existence as a shift unit of its mother institution. This continued for about seventeen years, till mid-sixties of the last Century, when in 1964-65, under the Phased Reduction scheme of the UGC, these different shifts turned into separate autonomous college. 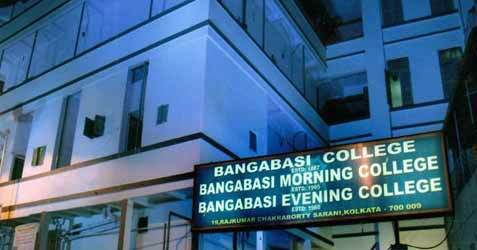 From that time onward, BANGABASI MORNING COLLEGE has acquired her own identity as a full fledged independent institution, affiliated to the University of Calcutta.